Lemongrass Roasted Chicken that’s juicy, tender and beautifully fragrant with South East Asian flavours of lemongrass, chilli and lime. Would you believe it if I told you that this is the first time I cooked a whole roast chicken in years? It seems some of my fondest food memories – those of eating Mum’s roasted chicken with my bare little hands as a child, have found little resonance with Mr Chipconnoisseur or the kids who like their meat “off the bones please”. Despite this, I couldn’t contain my craving for whole roasted chicken any longer so the other day I picked up an organic chicken and finally cooked it! It was juicy, tender and beautifully fragrant with South East Asian flavours of lemongrass, chilli and lime. I chose to use organic chicken but that's my personal choice. Free range chicken is just as good an alternative if you're on a budget. Roasting times are generally 20-25 minutes per 500g, on the middle shelf. Wash chicken under cold running water. Pat dry with a paper towel. Next separate the skin on the breast area by sliding your fingers gently between the skin and the breasts. Be careful not to rip the skin. Set aside. Place sliced lemongrass, chilli, coriander seeds in a mortar and pestle. Crush to a rough paste. Add olive oil and fish sauce. Mix well. Rub 3/4 of the paste all over the chicken. Rub the remaining 1/4 of the paste into the breasts, under the skin. Place remaining lemongrass and sliced lime into the chicken cavity and fold over skin flaps. Place chicken in the middle of a roasting tray. Roast chicken for about 1 hour and 15 minutes (20-25 minutes per 500g). Remove from oven and allow to rest for 5 minutes before serving. I love roast chicken. 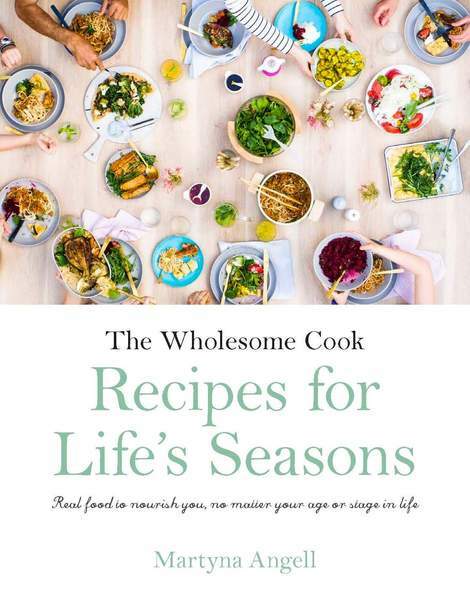 I think it isn’t the kind of thing you bother cooking unless there are more people around the table (although, I can’t think of a better thing to have for leftovers – sandwiches, salads and pies all come to mind). Your version with fragrant asian ingredients sounds heavenly. I went years not cooking a roast chicken because it just seemed so easy to buy one at the supermarket. Then one day, on a whim and on sale, I picked up an organic chicken and roasted it. I haven’t bought one from the supermarket since. 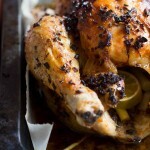 Your lemongrass roasted chicken looks amazine! Am laughing as I have not cooked a whole chicken for eons either 🙂 ! I love the ‘feel’ of this simple Thai-style recipe and my pots of lemongrass outside are demanding to be useful more often! Since no houseguests in the offing till I ‘get rid’ of Tour de France and the Olympics, may try to tweak this with chicken pieces, selfishly for me, me, me!! Everyone should know how to make a good roast chicken! And this one looks wonderful! I love lemongrass and I love the addition of coriander seeds. What a beautiful looking roasted chicken. The photo leapt out at me off of Tastespotting! Oh wow that sounds lovely. I’ve had the lemongrass spring rolls from Trader Joe’s and I fell in love with those flavors. I’ve never cooked with lemongrass before, but that chicken sounds so delish! I’ll have to try to find some at the store. Oh dear.. I cook whole chickens all the time.. sometimes two at a time. Not because I’m particularly inventive, I find a whole chicken so easy to through on our barbecue rotisserie. I love your rub.. fabulous.. I must use this one for our next chicken or two, lol! We had this for dinner tonight and it was delicious! Thank you! 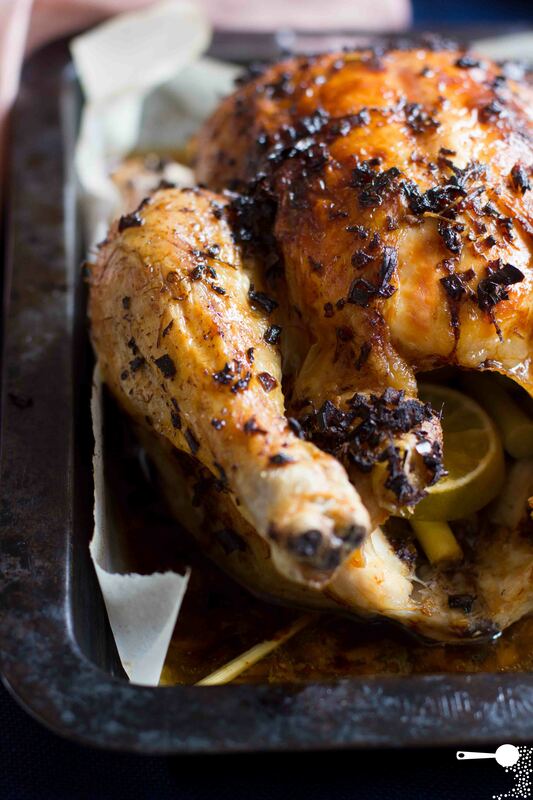 This roast chicken looks incredible! I haven’t had one in a while. I need to change that! I bet that smells and tastes amazing. Mmmm. I love the flavors of the marinade. This is bookmarked! Excellent recipe, can’t wait to try it! Meat off the bones is dry, tasteless & boring, thumbs up for whole roasted chickens!